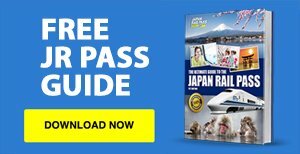 Once you are at Narita Airport, head straight to a JR Ticket Office to exchange your JR Pass voucher for the actual JR Pass and get a seat reservation on the next Narita Express train to take you to downtown Tokyo. 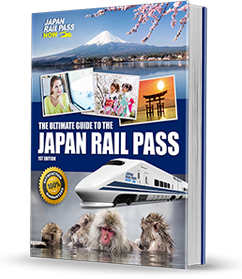 Some of the top-rated attractions in Tokyo are easily accessed via the JR lines. 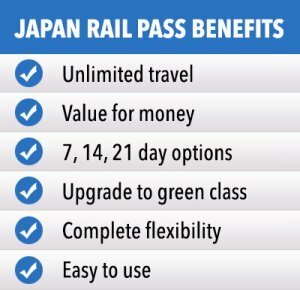 To make the most from your pass, choose to check out sites that are located not too far from JR Stations. As an example, you can take a JR train to Shibuya Station, which is along the JR Yamanote Line, to see the Hachiko Statue and the Shibuya Crossing, which are both right outside the station. Explore the numerous malls, specialist shops and department stores in the area. About a 20-minute walk away is Harajuku, which is the next stop along the Yamanote Line and where you can find the Meiji Jingu shrine and the popular shopping streets of Takeshita-dori and Omotesando. Shopping there can keep you busy for the entire day! 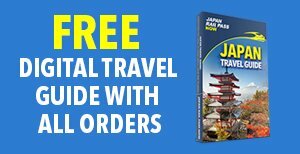 You can also go to Ueno Station and visit Ueno Park, Ueno Zoo, museums (National Science Museum, Tokyo National Museum, Tokyo Metropolitan Art Museum, Shitamachi Museum, National Museum of Western Art), and temples and shrines (Toshogu Shrine, Kaneiji Temple, Kiyomizu Kannon Temple, Bentendo). Less than a 20-minute walk from Shinjuku Station, you can find Shinjuku Gyoen, one of the best parks in the city; the Tokyo Government Building, which offers scenic views of the city via its free-of-charge observation decks; and Golden Gai, Kabukicho, among others, for bars, clubs and nightlife. If you (or the kids) are big fans of Disney parks, Disneyland and DisneySea are easily accessible via the JR Keiyo Line. Both parks are about a 20-minute train ride from Tokyo Station. For otaku culture, the districts of Akihabara, Ikebukuro, and Nakano Broadway are a short walk from their respective JR Stations and have a wide selection of shops and stores that specialise in manga, video games, cosplay costumes, electronic goods, and more. 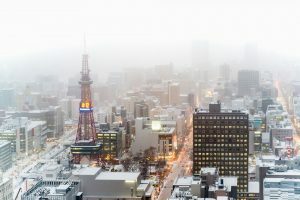 The fifth largest city in Japan and the capital of the Hokkaido region, Sapporo is a popular winter destination. This is especially true during the Sapporo Snow Festival, a week-long colourful and vibrant annual event held every February. It attracts around two million tourists from around the world, drawn to the amazing, intricately crafted, large statues and sculptures made of snow and ice. Sapporo is quite a long way from Tokyo, and train travel takes about eight hours. Using your JR Pass, you can take a Shinkansen from Tokyo Station to Shin-Hakodate-Hokuto Station, and then transfer to the Ltd Exp Super Hokuto line to reach Sapporo Station. The Sapporo Snow Festival is held on three different sites across the city — Odori, Susukino and Tsu Dome. 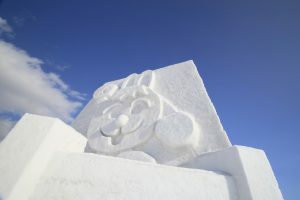 The festival’s primary site is located in Odori Park in the city centre, and showcases snow sculptures of varying sizes, with some as high as 15 metres and as wide as 25 metres. 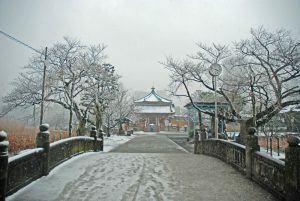 The Susukino Site in the city’s main entertainment district is home to approximately one hundred statues and sculptures, while the Tsu Dome Site, near the downtown area, also has several snow sculptures, and even has snow rafting and snow slides. There is more to Sapporo than the snow festival. It has an open air museum, called the Historic Village of Hokkaido, which contains dozens of Meiji and Taisho Era buildings that made up the region’s town, fishing village, mountain village, and farm village back in the day. Sapporo Beer, which is one of Japan’s oldest and most famous beers, originated in Hokkaido, and its story and progress throughout the years are laid out at the Sapporo Beer Museum. Destinations for souvenir and food shopping include the Sapporo Factory, the Nijo Market, and the Curb Market. 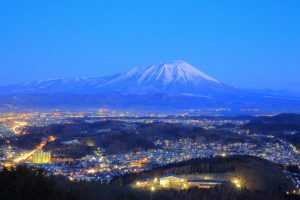 There is also a nearby ski resort, called Teine Ski Resort, where you can enjoy skiing, sledding and tubing and see some of the ski facilities used during the Sapporo Winter Olympics in 1972. Asahikawa is Hokkaido’s second largest city and it observes its own snow festival every year, the Asahikawa Winter Festival. During the festivities, gigantic snow and ice sculptures of castles, fortresses, animals, cartoon characters, and more are displayed across the city. From Sapporo, it is about an hour and a half train ride away. With your JR Pass, board one of the following trains: the Ltd Exp Lilac, the Ltd Exp Soya, or the Ltd Exp Okhotsk line at Sapporo Station to reach Asahikawa Station. There are two festival sites to visit during the Asahikawa Winter Festival. The Asahibashi Site, which is found by the river near Asahibashi Bridge, offers snow slides, horse sleigh rides, snowmobile rides, and an ice bar in addition to the statues and sculptures. It also is the venue for the event’s opening and closing ceremonies that typically involve a fireworks display. The other festival site is called the Heiwa Dori, which is a kilometre-long pedestrian street that starts right outside Asahikawa Station and extends to the Asahibashi Site area. It contains about 50 snow sculptures that are part of an ice sculpture contest. With another full day to do some more sightseeing in Asahikawa, why not visit the Asahiyama Zoo? With its diverse collection of animals, including eagles, wolves, deer, penguins, giraffes, apes, big cats, seals, lesser pandas, leopards and polar bears, it is a must-visit if you love nature or if you are travelling with kids. Also, do not forget to try Asahikawa ramen, which you can find in restaurants throughout the city, most particularly at the Asahikawa Ramen Village. It is made with shoyu based broth, ramen noodles that are hard, wavy, and thin, and topped with pork, eggs, bamboo shoots, and green onions. A freshwater lake considered to be the highest in Hokkaido at 800 metres, Lake Shikaribetsu is a scenic destination that is surrounded by imposing mountain ranges. 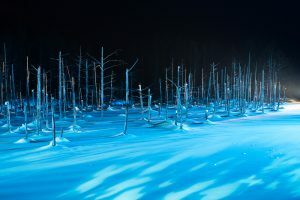 During the winter, when the lake freezes over, the area observes a festival called Shikaribetsu Kotan, which features a snow and ice village consisting of igloo-like houses. To get there from Asahikawa Station, take the Ltd Exp Lilac line to Sapporo Station and then transfer to the Ltd Exp Super Ozoro line going to Obihiro Station. This part of the journey is covered by your JR Pass and takes four and a half hours. At Obihiro Station, look for the route bus that goes to the lakeside. The ride takes about an hour and forty minutes. Spend a day checking out the snow buildings and houses built on the frozen lake. You can actually enter and see the walls and foundations of these structures up close, with their pillars, interior design, ceilings, and so on. 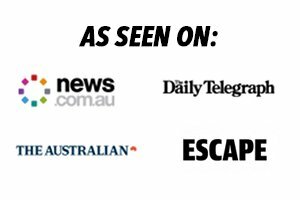 The exhibition takes place every year from mid-January up until the end of March. There is an outdoor bath with hot, high quality onsen waters by the banks of the lake, so take a dip to relax and calm your tired and sore muscles, while enjoying the gorgeous views of the virgin forests and snowcapped mountains. 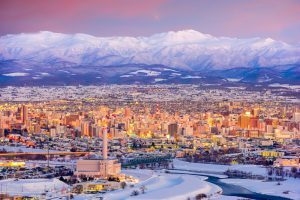 Iwate Prefecture’s capital city, Morioka, is a beautiful city encircled by mountains and features several rivers. From Lake Shikaribetsu Kotan, take the bus back to Obihiro Station. From there, with your JR Pass, catch the Ltd Exp Super Tokachi line to Minami-Chitose Station, and then transfer to the Ltd Exp Super Hokuto line to get to Shin-Hakodate-Hokuto Station. At Shin-Hakodate-Hokuto Station, catch a Shinkansen headed to Morioka Station. 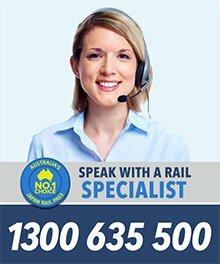 The whole journey takes about ten hours. The Iwate Snow Festival is an annual winter festival held in early February at Koiwai Farm, at the base of Mt Iwate in Morioka. During the celebration, large and small snow sculptures are set up, horse sleigh rides and sledding facilities are available, and food and drink kiosks and shops are open throughout the city. It also features kamakura, which are igloo-like snow structures, where visitors can get a taste of the local cuisine accompanied by sake. Onsen are also popular at this time of the year, and staying at least one night is recommended so you can enjoy the fireworks displays and illuminations that are usually part of the evening festivities. To return to Tokyo to catch your flight back home, take a Shinkansen from Morioka Station to Tokyo Station. Use your JR Pass to get a seat reservation on the next Narita Express headed to Narita Airport at a JR Ticket Office at Tokyo Station. 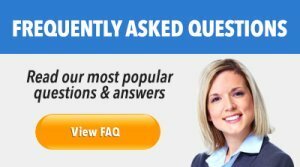 The entire trip takes about three and a half to four hours.